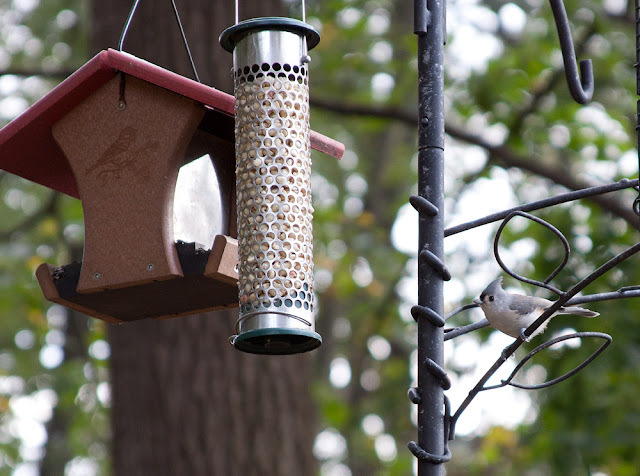 Tufted Titmouse at the feeders in late October. This year I'm taking part in Project FeederWatch, which is celebrating it's 25th year. It's the first time I'm officially counting the birds that visit my two feeding stations (and garden). I registered earlier this week so I don't have my official login information yet, but I'm keeping a notepad handy to record information until it arrives. The official count runs between Nov. 12, 2011 and April 6, 2012. According to the website, data from Project FeederWatch helps "scientists track broadscale movements of winter bird populations and long-term trends in bird distrubution and abundance." To avoid counting the same birds over and over, the directions specify to count the largest number of each bird variety you see at one time. For example, earlier this morning I only saw one tufted titmouse at my feeder, but by this afternoon, there were three in the garden at one time. So my current tally is three. I only count birds for two consecutive days, then I skip five days (different directions apply if you do not count online). Since I don't have my official kit yet, I'm considering treating today as a trial day, and making my usual count days Sundays and Mondays, when I definitely would have more access to watching the feeders.